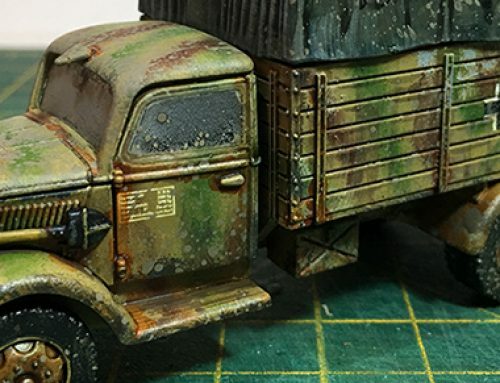 I‘ve been a bit busy the last couple of weeks so have missed going to the wargames club. 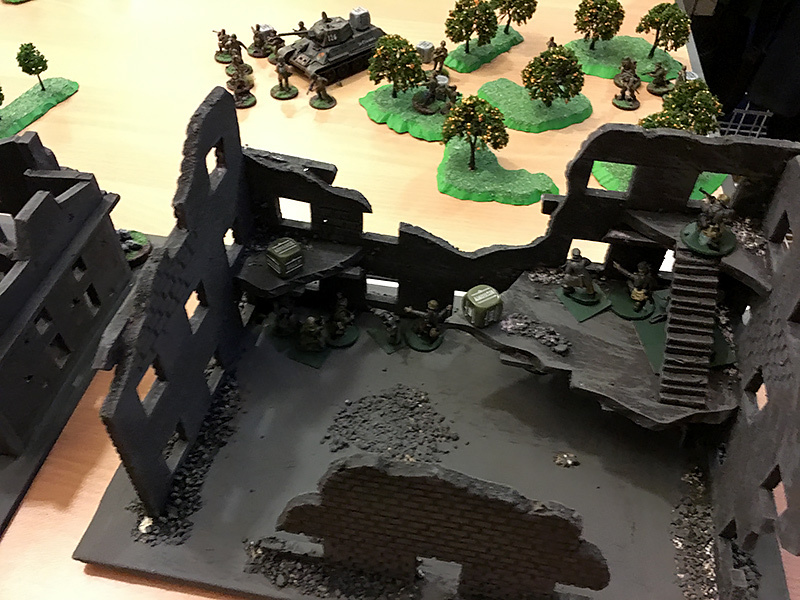 I got back into it this week with my second ever game of Bolt Action. Mark & I are still both learning the rules, so there are lots of references to the book but I am sure these will decrease as we play more. This time we did a little scenario. Mark played his Germans and I took my Russians, we had 1,000 points each. 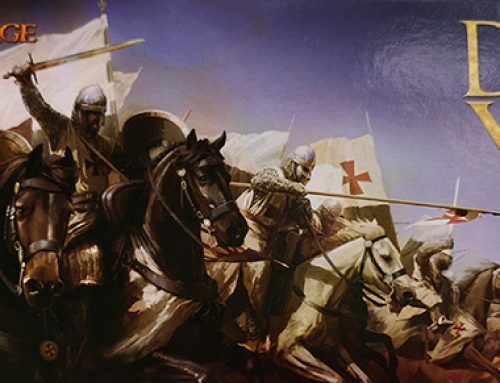 Mark was tasked with setting up in the village and holding it against a Russian attack. 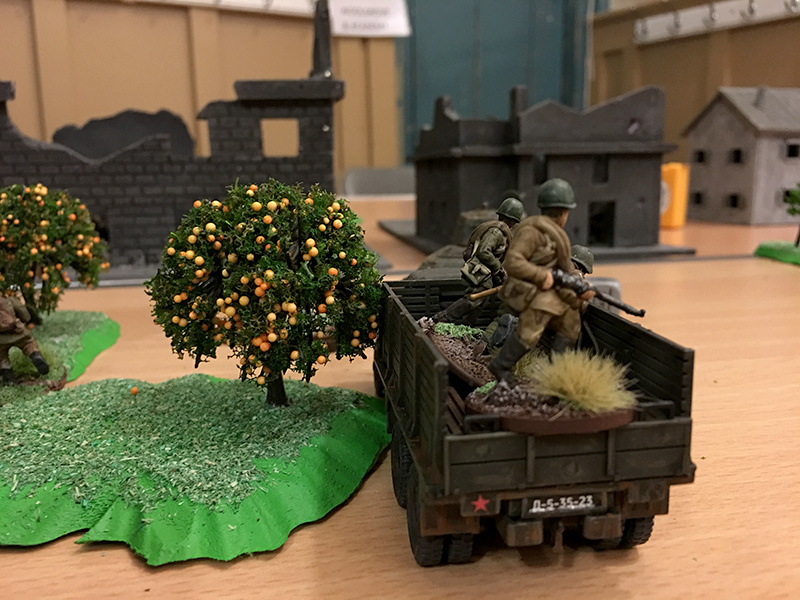 I took some of the Chinese trees I got from AliExpress a few weeks ago and a few foam board buildings which I still haven’t finished. 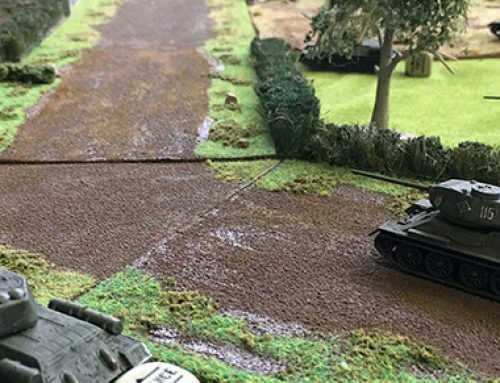 The German Tiger opened fire on the Russian AT gun but missed with it’s first shot. It was to prove quite ineffectual in the game, remaining in situ throughout. The T34’s first shot, likewise missed the mark. 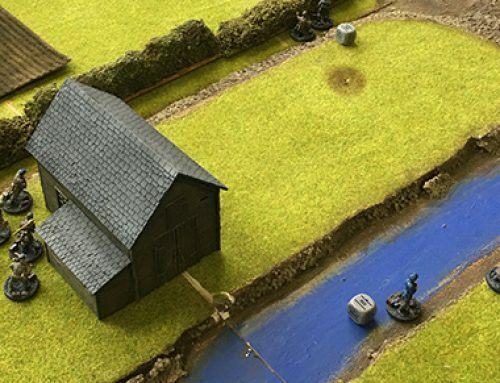 The Russian AT gun and mortar concentrated on troops within the smaller ruined house, though it took a couple of rounds for the mortar to hoe in on the target. The Russian rifle and SMG combinations were to prove quite effective firing from cover on the advancing Russian infantry. A rifle squad on board the truck move up behind the house to stay out of view of the Tiger. Meanwhile, the sniper team enter the house and make for an upper storey window. 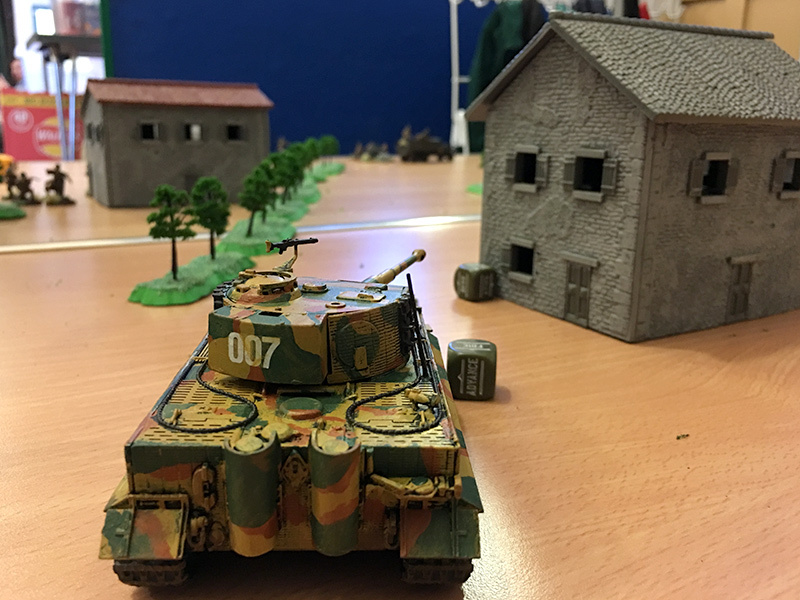 The Tiger remained pretty much in this position for the game preventing a full on assault of the German centre. 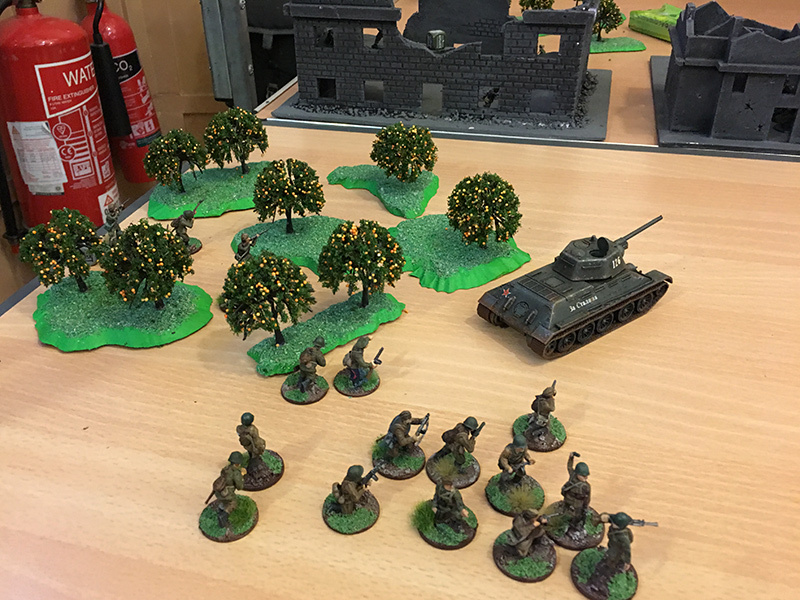 A German squad remain in cover hoping to pick off the advancing Russian infantry. They did a reasonable job of it too. In turn two things started to happen. 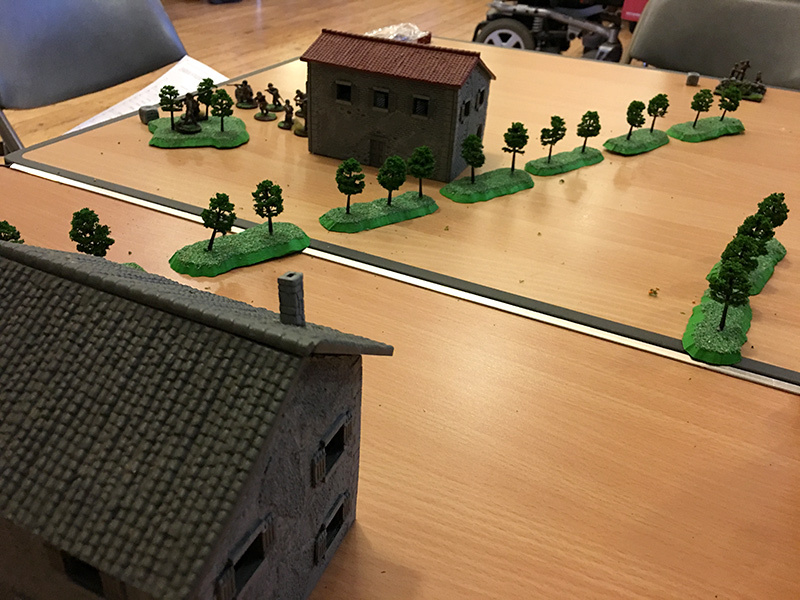 The Russian infantry were close enough to the village for the Germans to open fire and they were able to pick off targets. 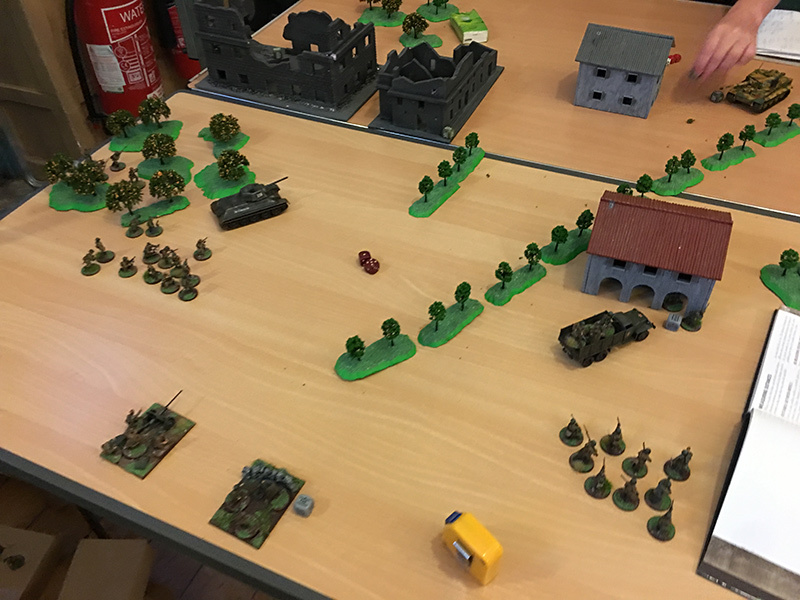 The dice were certainly rolling well for Mark and his German infantry squads, they managed to take casualties from both Russian squads on the left flank. 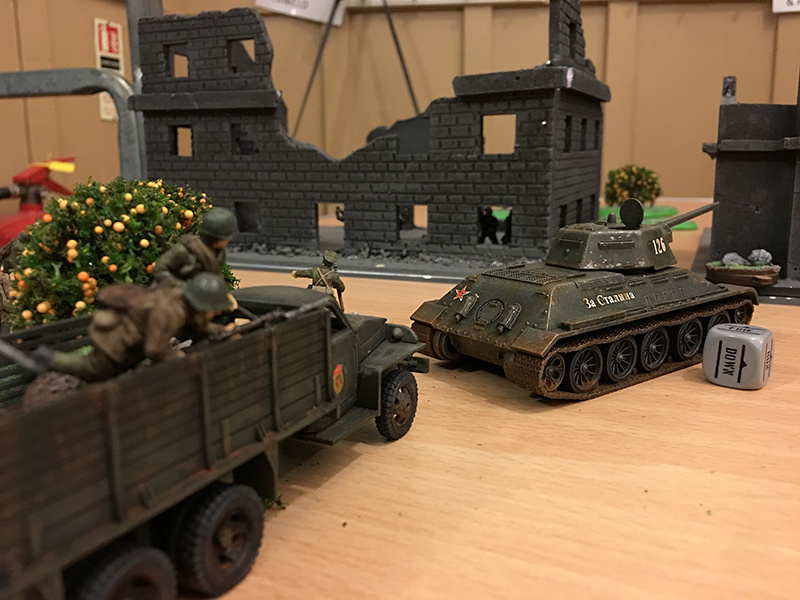 The Russian motorised squad advance up behind the T-34 after a change of orders having moved from the right flank to support the attack in the centre. Sadly, time ran out before we could conclude the Russian attack on the village. As it stood, the Russians had lost 4 dice. 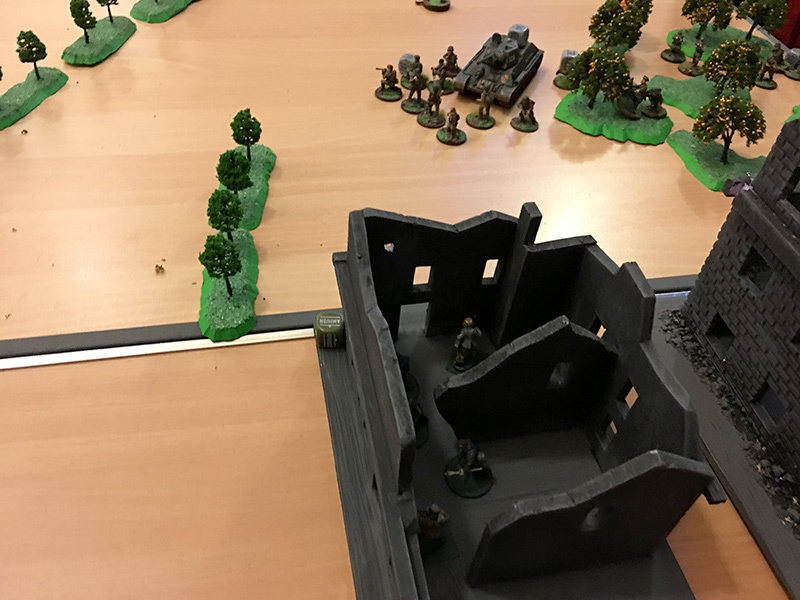 Two of the infantry squads had suffered greater than 50% casualties and then failed a morale test meaning they routed from the board. 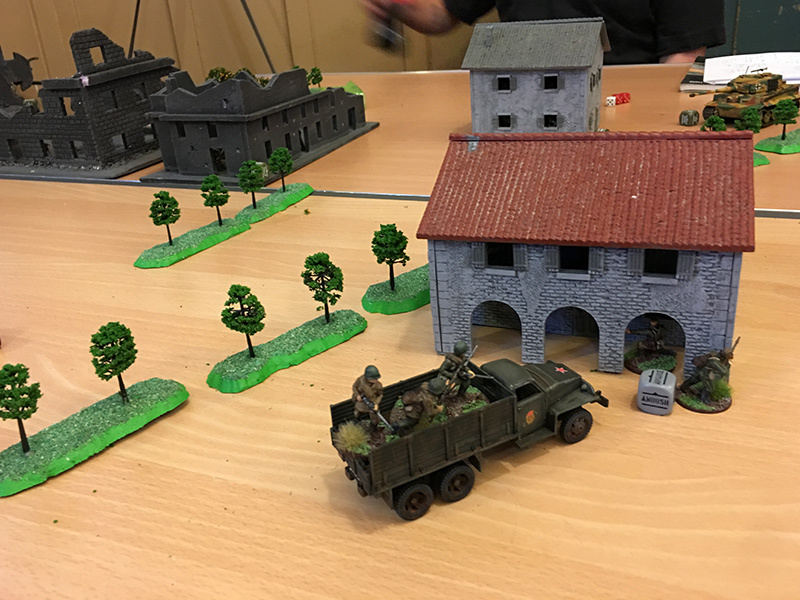 Although the T76, 45mm anti tank gun and mortar crew were all inflicting damage on the Germans , it may have been one more turn before the Germans started to lose dice. 10pm came and we had to pack up. It was an interesting game and some more rules were explored and learned. 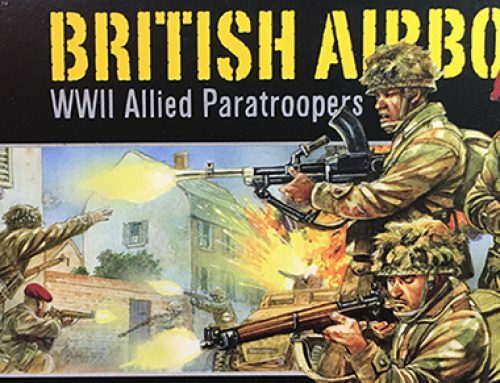 I might give my Americans a run out next time.